Get a preview of the Phoenix Theatre's production of Yerma with a sneak peak at some of the production photos, online now! Times Colonist arts reporter Adrian Chamberlain interviews Director Warwick Dobson about Yerma. 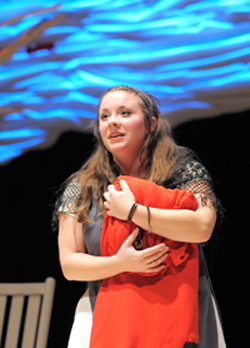 "Yerma a dark, elemental delight" Read Chamberlain's review of Yerma in the Times Colonist. "Yerma is a powerful, poetic piece of theatre not just about a woman's desperate desire to become a mother, but about Spain herself....Make the trek to UVic to see this moving and beautiful production." Monday Magazine's review by Amanda Farrell-Low has just been posted on their website.
" ...a clear-headed production of this challenging material that makes effective use of music, song, chorus and movement..." Read CBC reviewer Monica Prendergast's review of Yerma on her blog. "...for a challenging, powerful piece of theatre, you couldn’t do better." Read the Nexus review in the Camonsun College newspaper. The Phoenix's fascinating Pre-show lectures are now available online! Click here to listen to the lecture for Yerma recorded November 12, 2010. Dr. Marina Bettaglio from UVic's department of Hispanic and Italian Studies speaks about the playwright, Federico García Lorca and the many themes and historical influences behind his play Yerma, which is set within the political context of the short-lived Spanish Second Republic (1931-1939).